The Department of Theater and Dance offers two degrees on the undergraduate level: a Bachelor of Fine Arts in theater, and the Bachelor of Arts Degree in Theater. Both degrees provide a strong background in theater arts and dramatic literature and ample opportunities for participation in play production and workshop activities in three campus theaters. The Bachelor of Fine Arts degree is designed to prepare professionally oriented students for a career in theater. Students in the Bachelor of Fine Arts program pursue an emphasis in acting. The Bachelor of Arts in Theater offers students the opportunity to pursue a concentration in Design, Directing, Playwriting, Theater and Community or Theater and Performance Studies. The department also offers both M.A. and Ph.D. degrees at the graduate level. Students in the Bachelor of Arts program may focus on any one area or a combination of concentrations outlined below. Many lower division requirements for all concentrations are similar. Students move into more specialized courses in their area during the second year all of which provides sound preparation for further study of theater practice. The University also has general education requirements providing the liberal arts education through theater. The major who enters the department as a freshman can complete a bachelor's degree in four years. Students who transfer to the department from another school or another UCSB department should contact the Department of Theater and Dance office before or at the time of transfer to determine the courses that will be needed to satisfy the requirements for their bachelor's degree. 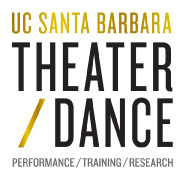 Students attending other schools who plan to transfer to UCSB Theater and Dance are invited to contact the Theater and Dance office for information concerning lower-division requirements that they could complete and transfer to UCSB. Students in the B.A. program in theater will choose a concentration in one of the following areas: design, directing, playwriting, theater and community, or theater and performance studies. Learn more about the Major Concentrations. The Bachelor of Fine Arts in Theater with an emphasis in Acting is a highly selective three-year program that students enter at the beginning of the sophomore year. It prepares exceptionally committed, disciplined and talented students for entry into leading graduate conservatory training programs, internships with regional theatres, and the profession. The goal of the faculty is to prepare each student for an enduring and artistic life in the theatre. The B.F.A. Program is essentially geared to the stage actor and gives the student understanding and practice in a wide range of styles and techniques. Work in the classics, modern world drama, and the avant-garde provides a challenging acting experience in different genres. The core training consists of a comprehensive series of acting, voice and movement classes. Further, students are given numerous opportunities to consolidate their training in departmental productions. All of the students who are accepted into the final years of the program are individually prepared for national auditions. We have successfully placed graduates in some of the finest M.F.A. programs, regional theatres, Shakespearean festivals and acting companies in the country. The B.F.A. in Theater with an emphasis in Acting attracts students who are dedicated to finishing the entire training process. Entry to the program is by audition; and completion depends upon successful progress. The Department of Theater and Dance offers two minors - the Theater Minor, and the Theater Minor with a focus on Production & Design. UCSB's Division of Dance offers two degrees, the Bachelor of Fine Arts (BFA) and the Bachelor of Arts (BA). Both programs are studio centered and emphasize performance and choreography. Both require daily classes in modern dance and ballet. Program coursework includes theoretical as well as technical aspects of dance, and allows for breadth of experience in related arts and sciences. The BA degree offers a strong dance component within a liberal arts education. The BA is less specialized, less structured, and has fewer major requirements than the BFA. The BA allows students to undertake coursework in related fields in order to prepare themselves for alternative dance careers such as dance therapy, dance administration, dance history and dance education. Requirement Sheets - Dance Major B.A. and Dance Major B.F.A. The B.F.A. degree in dance is specifically oriented toward training the dance student for a professional career in performance and/or choreography. The curriculum is highly structured and provides daily professional training through a multitude of course offerings in dance and related arts that are designed to stimulate the potential artist toward his or her highest level of achievement. Central to this degree option are technique courses in modern dance and ballet which progress in sequence. Throughout the student's residence in the dance major, a minimum of eight technique classes per week (ballet and modern) is required. For graduation, the B.F.A. student must fulfill the minimum of proficiency requirement in technique by passing Dance 147C and 156F. Because of the focus of the professional degree, students are expected to maintain rigorous technical program. Courses in improvisation, choreography, repertory, and performance are integral to the studio aspect of the program, while classes in dance history, criticism, music analysis and musical resources build an in-depth knowledge of the literature of the field. Additionally, required courses in areas such as costume and lighting design, acting, mime, anatomy, and arts appreciation as well as optional classes in jazz, musical theatre, and pedagogy assure that graduates of the program are prepared to enter the profession with a broad enough background of experience to embark upon dance careers as independent artists. Eligibility for this professional degree will be determined through an evaluation by the faculty of the student's potenial to fulfill the stringent requirements for the degree within the time normaly expected for marticulation. Requirement Sheets - Dance Major B.F.A. and Dance Major B.A.